I start my speech with the name of Allah, the Compassionate, and the Merciful. All our praises and glorifications is for Allah, the lord of the worlds. May His peace and blessings be upon our Prophet Mohammad, his family and his companions. May Allah (c.c.) bless our Sheikh, guide and spiritual trainer Shahid-ulHaramain and grant him a mighty maqam on the Day of Judgment. My dear brothers and sisters, I am grateful for that our Almighty Lord let me here be with you and address you today. I have been longing to be here and make this speech in your presence. However, the conditions were adverse and I have had no chance until now. May Allah (c.c) remove all the pains, troubles and disasters that the Muslim ummah, the Muslim world is facing today and protect them. My dear brothers and sisters, we are incapable of sufficiently praising Allah for His blessings, for He granted us our deen of Islam and He let our Sheikh leave his manners as a legacy for us. My dear brothers and sisters, we praise Allah the Almighty for the valuable manners of our Sheikh are compatible with the sharia that our Prophet Mohammad (pbuh) brought to us and his high manners. My dearest brothers and sisters, there is dignity and honor in the manners of our Sheikh (k.s). They are in high levels of imaan. These manners encourage Muslims to live in accordance with the deen of Allah. They let Muslims reach at the highest levels. They strengthen love, respect, attachments, unity and solidarity between Muslims. Therefore, my dearest brothers and sisters, we need to put a great deal of attention to the manners of our Sheikh. This is because these manners in the way to high spirituality embed the strongest imaan in the hearts of our youth and all Muslims. They make a person a genuine and true Muslim. My dear brothers and sisters, the manners and methods of our noble Sheikh are clear of political interests, all kinds of exploitations and worldly profits. They are solely and sincerely for Allah (c.c.). They do not belong to any particular sect or group. They are general, and they are for the entire world. My dear brothers and sisters, therefore, the manners of our noble Sheikh (k.s) are different. The order of our Sheikh is different. 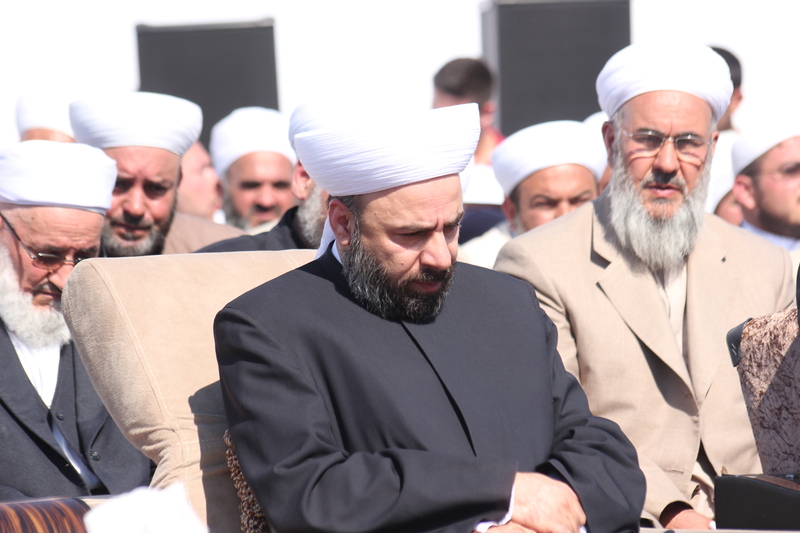 The manners of our Sheikh are in accordance with the sharia of our Holy Prophet Mohammad Mostafa (pbuh) and his ikhlas. I plead to Almighty Allah, please you too pray for me. May Allah give me strength and power. May He make me successful in protecting these bright and neat manners. My dear brothers and sisters, people who have virtue and acquirement like my father, our Sheikh passed away from this world. He was addressing you in this mascid, he was showing you the right path here. He is no longer with us. He left me, this destitute servant of Allah, here in his place. He was not seeing himself as a person who reached at high levels or was wise. He left and left people like me behind him. My dear brothers and sisters, as you are present in these meetings; you realize that you are in goodness and barakah. You feel like you are present in his assembly. You are here to hear a verse of our Almighty Allah (c.c. ), a holy hadith of our Prophet (s.a.v. ), an exemplary anecdote of the holy people who lived before us. You are here to take a lesson from them. You have got together here around this weak servant of Allah with the intention to hear whatever goodness you intended in your heart from my mouth. My dear brothers and sisters, I heard from my father and Sheikh. He said that there was a very strong both between Hasan-i Basri and Omer (r.a.). There was guidance and irshad bond between them. They loved each other very much. When the Omer (r.a.) become a caliphate, Hasan-I Basri wrote a letter to him and said that: ?Oh Omer! This world is horrifying. Acknowledge this deeply: Adem (a.s.) was dismissed from Cannah for he inclined to the world. While living in this world, everyone should be curing his or her wounds. Ones who heal their wounds feel the pain of the treatment. In order to cure it properly, they need to persevere the pain of the medicines and be patient. If they do not endure it and be patient, it is inevitable to face ever bigger troubles for their wounds will not heal. My dear brothers and sisters, a great number of people lived, worked and endeavored in the world before us. Eventually they left here and gone. Every Muslim should witness this flow, the conditions and events of this world and draw a lesson from the ones who are gone. My dear brothers and sisters, one day we will leave this world as they did. There will be other people coming after us. Hz. Ali (r.a.) said that ?May Allah?s compassion be upon the ones who reflect on this world and draw lessons from it. How great is that they take lessons from it and go to the other world from this one in this state.? My dear brothers and sisters, a wise person should think and know that this world is temporary. In this temporary period, one should learn how to benefit from this world. This world is given to us. Many blessings in it are treated us to use them with taqwa and ibadah. Not to commit sin and stray away from the right path. Allah (c.c.) gave them us to use them in His way. We need to benefit from our short lives in this way. My dear brothers and sisters, Prophet Isa (a.s.) said: ?The world is both desires and is the one desired.? The world desires us and we desire it as well. The world desires us and stays with us until our death. My dear brothers and sisters, if people spendtheir life with taqwa and ibadah, use their opportunity in the way of taqwa and ibadah, material benefits will come after that. If they prefer this world and spend their life in order to obtain worldly benefits, maqam and levels, the world deceives and destroys them. He is ruined then. My dear brothers and sisters, the world deceives the oneswhose heart is full of the love of world. It uses them. No matter how rich and wealthy these people are, they are poor in fact. They are deprived of the way of Allah the Almighty (c.c.). People whose hearts are full of the love of world at a loss. They are away from Allah. The ones who believe in Allah obey Him. The ones who know Shaytan keeps away from his traps. A person should spend his or her life remembering Allah with dhikr in any state; while sitting, walking, whatever he or she is doing. Everyone who wants to be true Mumin, a true Muslim should stick to their ibadah and taqwa. They should continuously meditate about the creatures of Allah and spend their lives by taking lessons from these creatures. My dear brothers and sisters, there are always obstacles and troubles in the way of being a true Muslim. When blessings are granted to a true Muslim, they are not permanent but temporary. Death comes and ends both these blessings and his or her life. It deprives him or her from this world. My dear brothers and sisters, reflecting on death is a great power for a Muslim in the way of Allah (c.c.). Allah the Almighty in His Holy Quran, and Hz. Prophet in his holy hadiths, great scholars of past who enlighten our path, have warned us with death. Death will be coming. They said there is death ahead of us. They said that whoever reflects on death, the life after death and makes preparations for it, he or she is a true Mumin, a true Muslim who takes lessons. My dear brothers and sisters, we need to be careful all the time. This is because this world is full of troubles and musibah. Such people came before us that they were patient with all troubles and musibah of this world. The world was not able to deceive them. They were not afraid of the world, they did not grieve even for the injustices they faced and they passed away with a complete ikhlas. My dear brothers and sisters, as the poet says, if you wish to hide from the darkness of the night, there is no way, you cannot! The world is full of troubles and musibah. Everyone?s mother dies, father dies, their children die. If a person sees the path of Allah badly, Allah sees him badly too. If you wish to get closer to Allah the Almighty and love Him, He loves you, too. My dear brothers and sisters, when a person dies, if we pay great attention to his non-living body, put on sweet scents, cover him with white winding-cloths and coddle him; there is no benefit in this for him. The benefit is only in taqwa, ibadah and good deeds. Therefore my dearest brothers and sisters, the destination, maqam and gains of a person is only with taqwa and ibadah. My dear brothers and sisters, somebody was praising Omer b. Abdulaziz (r.a.). Omer said to him, ?Do not qualify us. Do not praise us. If you will, come to my grave a few days after I die. Look at my state in there. Come when my stomach is swollen and worms eat my body and praise me then.? My dear brothers and sisters, a wise person is the one who does not put much importance to the world, does not take the world as a goal to him and does not care about the worldly benefits. My dear brothers and sisters, my father Sheikh (k.s) used to mention of people who had wisdom. One of them one day said that ?There are two kinds of wise people. The first is the ones who leave the world before leaving it. The second is the ones who embellish their grave with taqwa and ibadah.? My dear brothers and sisters, we are getting older, our lives get closer to the end, our time wastes away. Our graves are calling us. The earth calls out to humankind and says: ?Oh human! You are standing on me now but one day you will be in me. You will dwell in me. Oh human! You walk around on me keeping yourself happy. But you will be sorry when you come inside me. Oh human! You eat, drink and entertain yourself on me. But the worms will eat you out when you come inside me. You regale now. But you will cry when you come inside me.? You see, my dear brothers and sisters, our graves call us all the time this way and warn us. My dear brothers and sisters, there is an old saying. I am surprised of six things. Three of them made me cry. Three of them made me laugh. The ones who made me cry was to part from Hz. Prophet (s.a.v.) and his companions (r.a.), the judgment in the Day of Judgment and to come into the presence of Allah (c.c.). The three other things that made me cry is the person who desires the world and whom the world desires, the person who does not make any preparations though the grave calls him and the person who does not the necessary preparations with ibadah and taqwa for the path to the presence of Allah (c.c.). My dear brothers and sisters, we should be as Mohammed Mostafa (s.a.v.) asks as to be. He said: ?Be like a destitute passenger in this world.? My dear brothers and sisters, the world is beautiful, sweet. A person who uses it properly gains benefit from it and is not deceived. But the ones who do not use it properly both comes to a harm and loses it. I plead to the endless mercy of Allah to makes us successful in His way. May He reduce the place of world in our hearts. May He makes us the ones who holds it in their hands, not in their hearts. May Allah (c.c.) make us successful in His way and have mercy on us. Surely He is the Almighty one. My dear brothers and sisters, you missed me. I missed you too. Let us keep calm until we can see each other. Let us act within the framework of decency. Let us not make any noise or throng. May Allah bless you all. If you wait neatly and quietly, without harming each other and look after each other?s rights, I want to greet each of you with musafaha. But if you throng, I will go out and leave.